The results come from a survey of 4,971 US adults taken between August 8 and 21. They show that the number of people using the likes of Facebook and Twitter to find news stories is growing, up 62 percent from 2016. A somewhat surprising find is that more older Americans are turning to social media to keep up to date with current events. 55 percent of those aged 50 years or older use the services to discover news stories, a 10 percent increase compared to last year. When it comes to individual platforms, Facebook continues to lead the way, with 45 percent of all US adults using it for some of their news. 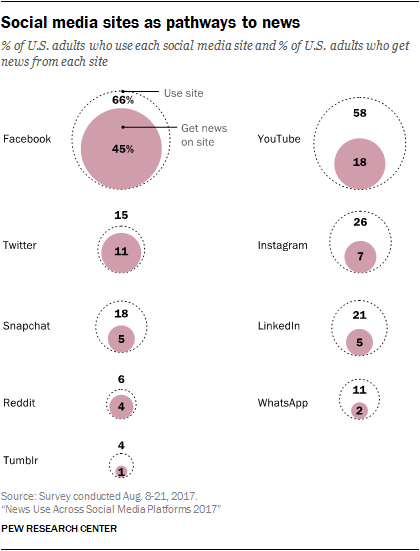 18 percent of adults get their news items from YouTube, while eleven percent favor Twitter. It appears that Donald Trump’s love of Twitter and the fact he uses it for official US policy announcements have increased the service’s popularity as a news site. 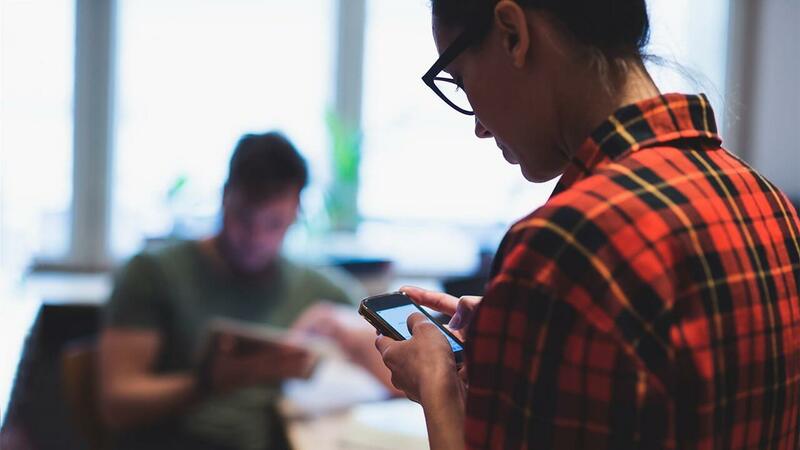 74 percent of users now get their news from Twitter, something CEO Jack Dorsey may be pleased to hear; the company changed its iOS store category from ‘Social Networking’ to ‘News’ last year. 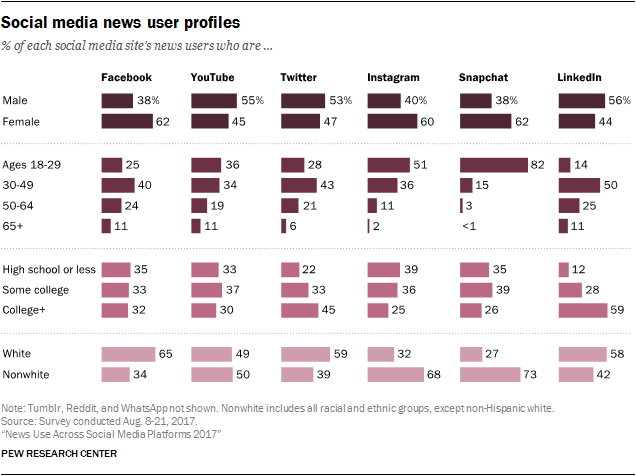 The report also discovered that Instagram and Snapchat news consumers are much more likely to be nonwhite and younger, while LinkedIn and Twitter have the largest share of college graduates among their news users. With so many people using social networks to discover news items, more is being done to clamp down on the spread of fake stories. Facebook, which was accused of influencing the US election last year through the sharing of false reports, has introduced several measures to combat the problem, such as letting users tag posts, as well as blocking ads on pages that share fake news. I'm older than DIRT and read Google News & Yahoo News daily. Last time I used social media, Lindbergh just landed at Le Bourget. Now this I can believe but the problem is that most of the news is just fake, not that this matters one iota, just as long as it's news. Reehahs and EClyde like this. There is pros and cons to getting news from both, news outlets and social media. You are more likely to get the truth out of social media. But then again you have people from both spreading the same crap from news outlets. That's all part of the plan to confuse people and it is working. People are so confused they don't know which side of the fence to stand on. And when the fence starts to weigh more on one side or the other, that's when the media goes to work on confusing people more. The media actually gets paid to keep people arguing. It has nothing to do with the truth. Much like a defense lawyer, it has nothing to do with the truth, it is all about the defense. Too bad there's such a high population of Contrarians on TS -- guess that's the new game in town. And God help the youngster that actually picks up a newspaper and figures out there is no button to advance the pages, much less discover that the pictures are NOT video links!!! First computer was a Heathkit I put together on the kitchen table; learned the job of dripping hot solder and being neat prevents smoke from rolling out of the case the first time you turn it on! The uk is probably not that different... Personally I get most of my news from the BBC as a lack of bias is in their charter. I haven't read a tabloid newspaper in years as the only thing they print that can be taken as 100% true is the date at the top of each page. The BBC! Not bias... You are joking right? seeprime and EClyde like this. Social Media was the actual start of the end. People in general these days are about as sharp as marbles, so I am not surprised at all. drjekelmrhyde, EClyde and jobeard like this. You're all too young to recognize Watergate, The Washington Post, Bob Woodward and Carl Bernstein and how the free press brought down a President. WWW, social media and the mantra of 'fake news' didn't exist. We read the W.P, WSJ, and New York Times - - watched with mouths agasp CBS, NBC & Walter Cronkite report how the President was complicit it the break-in at the Watergate and the Congressional committee headed by Sam Ervin grilled the Presidential staff. Today -- we just echo like parrots "fake news" and believe the question has been disposed of. The polarization of the parties and lack of loyalty to the constituents is appalling. I wonder just how many recall what a Bibliography is? Wouldn't it be nice to get the news and not the views. You're all too young to recognize Watergate, ? I believe those social media sites are the worst place you can get your news. You now see a lot of people who take information they see on these platforms without fact checking;They repost or repeat the misinformation orally and then it spreads. There are plenty of sites that people can use to verify that the information they are getting is accurate yet they do not; sites like motherjones, aljazeera, politico, politifact ect, who still employ the lost art of investigative, fact based journalism. drjekelmrhyde, Beerfloat and jobeard like this. I think your wrong about that. Nicely said - - we agree to disagree - - how polite! ^^ This post is not gold. It is pure platinum. So who are they biased towards exactly ? I'm guessing you are going to say the left... Only right wingers go around accusing something of being left wing just because it isn't right wing. maybe the left doesn't realize they are just as biased as they accuse the other side to be. People don't think of their own opinions as left or right. They just believe their ideas are correct without thinking which side those beliefs belong to. Your last sentence is wonderfully succinct, and expresses how many people feel. jobeard and EClyde like this. Do most people really believe that you are more likely to get the truth on social media? I think I'd like to start a poll for this just out of curiosity. It's mind boggling to me that someone came right out and said just that because I don't believe almost anything I see on social media. People who feel the slightest bit of anonymity have a much higher likelihood to lie as far as I've seen. I may do this poll next week to see what people think. mcborge and jobeard like this. Do most people really believe that you are more likely to get the truth on social media? I don't believe anything I hear on the news. You are correct about the trash on social media. But if you are going to hear the truth, it will be on social media. Good luck though recognizing it. And only a leftist would label someone right wing without knowing anything about that person. I'm not right wing. To dumb and lazy to look for yourself, BBC just released a video about 'digital black face' very left. They have had countless people on the BBC telling them how the wage gap is a myth and how it is worked on the average only, yet they keep repeating that lie Mr Goebbels. Then how about the BBC being paid by the eu to report favourable on the union, they took 2 million from the eu in the run up to brexit. But keep telling yourself they are not biased, as they say ignorance is bliss.